The unique Fisher Price Trike gives your little one a safe way to learn how to ride a tricycle. This trike features a 3-point Y harness with shoulder pads, seat belt and safety bar. This toy costs approximately £69.99 (for the latest and best prices make sure you check our retailer list for the Fisher Price Elite Pink Trike above). 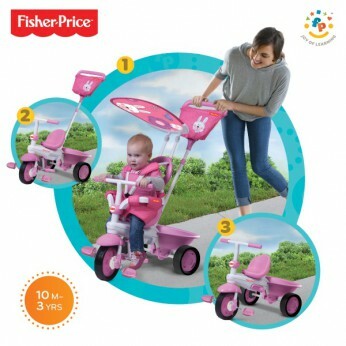 In our review of Fisher Price Elite Pink Trike we classed it as being suitable for ages 1 to 3 years but recommend you check the manufacturer specific advice before purchasing.